An inspection for our Vashon house was scheduled for this afternoon and takes 4-5 hours, so we decided to go visit the house for the afternoon. Gay took the kids to French camp and Gay and I took the ferry over to Seattle to the house. Kelly picked the kids up at noon and took them over to meet us at the house. Kelly took the kids to the park a couple blocks away and Gay helped me with the in-ceiling speakers. We took down all the speakers to put a piece of insulation behind each speaker, as recommended by the Noble Fidelity engineer to improve the bass (and provides some noise insulation to the floor above). In-ceiling speaker makers need to come up with an easier mounting system because it’s a two-person job — one person has to hold the speaker while the other attaches the wires, guides the wire into the hole and screws it in. It’s difficult to have two people on ladders right next to each other (although it’s nicer when it’s your wife that close to you) and it’s tiring to hold a speaker above your head, which is made worse by how delicate they are and a lack of comfortable handles. It’d be handy if the speakers had mounting brackets that held the speaker in place and allowed it to drop down freeing your hands to work the way some canned lighting housings do. There’s lots of miscellaneous work going on at the house. 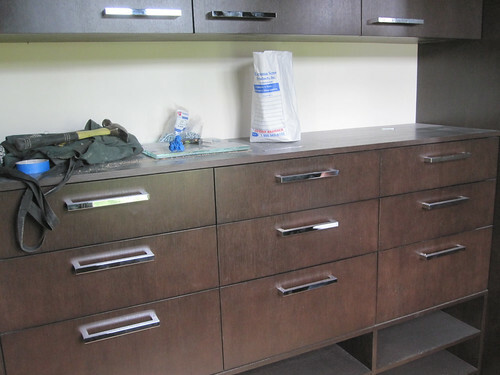 Cabinetry hardware is still being installed, only some of which has arrived. Most of the kitchen pulls are going to be very late as they take 10-12 weeks to make after they’re ordered and we only ordered them last week. So we’ll have blue tape as pulls on most of the kitchen cabinetry for a couple months. I got to use my closet cabinetry since that hardware is all installed. The big hanging pullouts and mirror work great and are easy to pull out and push in. All the appliances are installed and we got to play with the stove. One beverage fridge in the butler’s pantry was DOA, so the replacement will be delivered and installed next week. The washer and dryer are installed — those are nice-looking! The closet shelving and hardware is all installed in every room. The steel was put on the moving wall in the attic. The sliding doors are all painted — those just need bumpers to be installed on the tracks to keep them from hitting the edges and walls. All the fixtures are installed in the kitchen and bathrooms but there’s still a little bit of plumbing work to be done here and there. The basement shower glass was installed, with a cut-out handle that turned out well, so as to avoid having a pull on the glass. All the toilets are installed, except the master bath one that was cracked, so we’ll be missing a toilet in the master for a while. The kitchen tile and the master bath tile are all done and grouted. The master vanities are being constructed and should be done by move-in day but it looks like the decorative steel will be late. The decorative steel in the pantry is installed. The garage doors were installed, except for one opener that they didn’t have in stock (oddly, it’s the standard one, not the more rare jackshaft one), so I got to open and close it — smooth and quiet. Bill finished all the electrical and put really cool industrial light fixtures throughout the garage. The floor guys arrived in the afternoon to put the final coat on all the stairs. Next week is a short week but will be busy finishing all the loose ends. I think we’re going to have people still running through the house for a couple weeks after we move in. Then the exterior work can begin and, since I’ll be living there, maybe I can do some work on the decks. On the way to the house, we stopped at The Beer Junction to get some beer to stock the newly-installed fridge. At the end of the day, we had a beer with Mark while admiring all the progress. Thanks to the beer, I also got to use one of the Toto Neorest toilets for the first time; never having to touch a toilet to use it makes you wonder why it took so long — why should people have to touch the most unsanitary object in their house? 7 days until move-in, we’re getting excited! On the way home, we went to Talarico’s for pizza dinner. Hudson missed his usual nap so was very tired and fell asleep minutes after leaving the restaurant while Havana watched Toy Story 2 on the iPad.